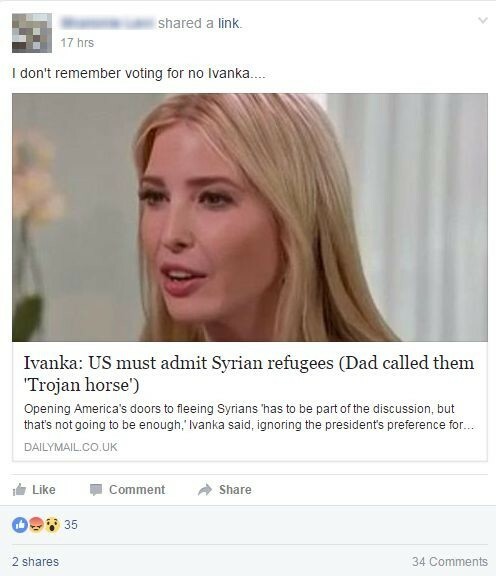 A band of fervent Donald Trump supporters are expressing their rage — this time at the president's own daughter, after she seemed to break with her father's position on Syrian refugees. Ivanka Trump, speaking on Wednesday on NBC's Today show, told reporter Hallie Jackson that she thought that opening America's borders to Syrian refugees "has to be part of the discussion," adding that such a step is "not going to be enough in and of itself." President Trump, of course, has markedly different views. He characterized Syrian refugees as a "Trojan horse" during the presidential campaign in September. "We have no idea who these people are, where they come from," he said . "I always say, Trojan horse. Watch what's going to happen, folks. It's not going to be pretty." Then, as president, Trump tried twice to ban Syrian refugees, along with other citizens from several Muslim-majority nations, from entering the United States. Now, fans of the president, many of whom formerly admired Ivanka Trump, are turning against her online. 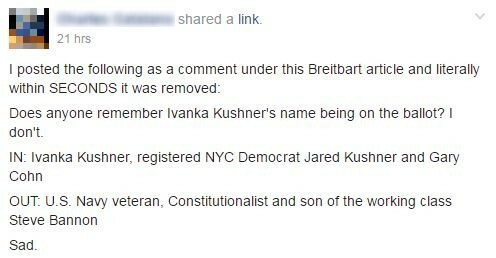 Commenting in various pro-Trump Facebook groups like "The Deplorables" and "Drain the Swamp," users were shocked and disappointed, with some stating that they did not vote for Ivanka, but rather her father. Some people characterized her and her husband, Jared Kushner, as Democrats, globalists, "demented," and worse. The conversation was similar on pro-Trump media outlet Breitbart, which was formally managed by Trump chief strategist Steve Bannon. Some commenters hoped Trump would remove his daughter from her position as White House adviser. This newfound resentment for Ms. Trump is a major shift from the admiration that many fans of the president once felt for her. Dozens of threads on Reddit's largest pro-Trump community praise Ivanka, with some even calling for a 2024 presidential run. Ivanka shot down speculation over her political aspirations earlier in April, saying "politics is a tough business." 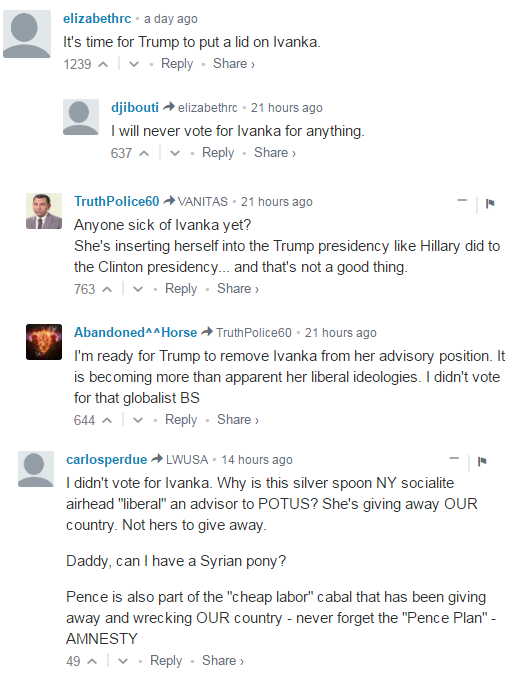 The post Trump Fans Rage At Ivanka Over Syrian Refugee Comments appeared first on Vocativ.